I used to feel quite strong about only allowing myself to celebrate when I reached the final destination. Any self-praise along the way felt like a token celebration and unnecessary. It was only in the last couple of years that one of my mentors taught me that this approach can actually stifle your progress by steering you off course and flattening your energy along the way. The common thread in all of these is that there’s no joy or happiness; it makes the completion of a task a neutral and irrelevant experience. This may seem like a pretty trivial point so to explain how it affects your results, I’d like you to visualise a scenario. And when the child finally completes the routine, the coach says “I knew you’d let the team down. You’re such an embarrassment”. In that moment, how likely is it that this young child would be operating with his or her best energy and enthusiasm? If you saw that scene, you would really feel for the child and you might even want to give the child a hug and say “Don’t listen to that, just do your best”. It’s easy to call out the bad behaviour when a child is being scolded, however by not celebrating your progress, this is what your inner critic is doing to you – it’s denying you the opportunity to receive any credit from yourself, and it’s actually a form of self sabotage because it will stifle your enthusiasm towards achieving your next task. The truth is, you’ll never reach the end of your list of tasks because there will always be something else to do. 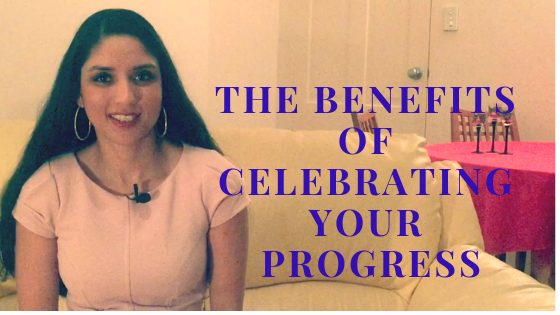 So it’s really important to learn to celebrate your progress along the way because it’s going to inject you with a strong dose of motivation and enthusiasm to keep going. By it’s very nature, the act of celebrating is happy and fun and this can really lighten things up if you’re facing a mountain of work. So my challenge for you is to start celebrating your progress this week. Decide how you’re going to celebrate the completion of these tasks e.g. treating yourself to some chocolate or an hour of TV, or even doing a victory dance! If you decide to take up this challenge, please leave me a comment below and let me know how you're going to celebrate your progress.